Somebody sent me an e-mail this morning about a built-in refrigerator we'd been planning to use in a kitchen I'm designing. It seems that this person had spent yesterday shopping for appliances and had come to the realization that I was speaking the truth when I told her we were talking about a six thousand dollar option to go with a built-in. When these things are just ideas on paper, they are easier to swallow it seems. When confronted with the thing you're going to keep milk and lettuce in, and that thing has a price tag with so many digits it's a different matter. It's a perfectly understandable reaction to have. I can relate completely. Her e-mail went on to ask what the deal was with built-in refrigeration in the first place, and what options are out there should they decide against the built-in route. Well, I'll tell you. Here's my promised honors track lesson in refrigeration for the home. A standard refrigerator is usually 36 inches wide, 72 inches tall and about 30 inches deep. It has finished sides and can be built loosely into a niche or left standing on its own. I live in Saint Petersburg, FL and the idea of a built in fridge is a bit cutting edge here so more often than not, I do what I call a fake built in. I build a 30" deep, 90" or 96" tall enclosure for the sides of the appliance and put a 30" deep cabinet above the appliance. The result is a loosely fitting enclosure for a free-standing fridge that makes it appear to the uninitiated as a built in. However, free standing refrigerators need to have air space around them so they don't overheat. So, they need to have a gap left to either side and above them. This photo shows such an arrangement. If you look closely enough, you can see the air space between the appliance and the cabinetry on all sides. This is as convincing an effect as is possible unless you buy a true built in model. A built-in refrigerator is a beautiful thing and a great idea if you can swing it and it makes sense in your house. They are not cheap. Ever. 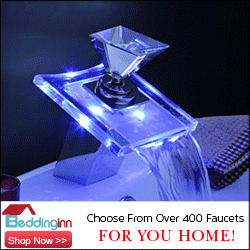 A built-in refrigerator will start in the neighborhood of six thousand dollars and go up from there pretty quickly. This beauty from Sub Zero is the Pro 48 and when it came onto the market three years ago it carried a sticker price of $14,000 (http://www.subzero.com/). They are not just expensive for the sheer joy of charging you more, at that level they do everything but peel your vegetables for you. In looking at that photo, you can see the thing that makes all built-ins, regardless of their manufacturers, instantly identifiable. That is the vent grill that's on the face of the appliance. That built-ins vent exclusively through their fronts and not a combination of their backs and bottoms is what allows them to be built in in the fist place. Due to that front ventilation, there is no need for the air space around the appliance and you can get them to disappear more easily. Well, maybe not disappear, but at least not stand out so much. A built-in refrigerator doesn't have finished sides, and it has to be enclosed. That's usually done with cabinetry, though sometimes I seem them sink into niches in the wall. A built-in fridge is taller than a standard and it's also shallower. A built-in fridge will allow you to have stainless steel doors as in the model shown above, or you can panel them. 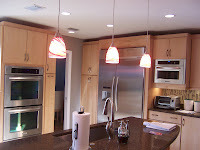 In the photo to the left, I used a 48" built in refrigerator from KitchenAid. The left side of the appliance is the freezer and the right side is the refrigerator. Every appliance in this kitchen was built in, so it made perfect sense to do the same with the fridge. Once you decide to go with a built-in fridge though, you have a couple more things to decide beside the obvious one of how big. The refrigerators I've shown so far have had stainless steel door panels. I think they look modern and cool, but not everyone shares my enthusiasm for modern and cool unfortunately. A built in can be paneled in one of two ways and it is a specific model that handles each of these panels, no one model can do both. The first is what's called a framed panel. I'm showing a framed panel to the left. 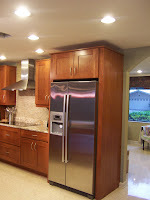 Panels that match the cabinetry in a kitchen fit into grooves and channels on the face of the appliance. This leaves a refrigerator door that framed with steel, hence the distinction "framed." The upper vent grill can also be made to accept a panel in the same way. This will get you half way there so far as I'm concerned. If you're going to panel a built-in refrigerator, go whole hog I say and do what we call an integrated panel in the parlance of our friends at Sub Zero. 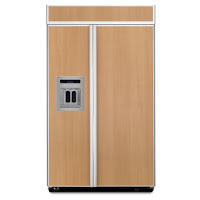 A refrigerator (or freezer for that matter) model that can accept an integrated panel dispenses with the grooves and frames on the door, and leaves no trace of how the panel are attached ot the appliance. It's like magic almost. 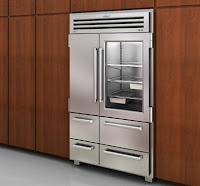 Most times, integrated refrigeration gets disguised as an armoire or other piece of furniture, and is unidentifiable as a fridge until it's opened. In the photo to the left, the Sub Zero model sits quietly and pretends to be a pantry until it's called into use. Pretty slick of you ask me. So the long and short of built-in refrigeration is that it's pretty simple to explain, expensive to buy, and unless it's in the hands of a professional, a bloody mess to figure out how to install. Fully integrated, built-in refrigeration like the one shown in the photo to the right is not a project for the do-it-yourselfer. I cannot state that enough times. The learning curve on these things is steep, steep, steep and dealing with them is unfit work for dilettantes and the faint of heart.